410 slugs put a single lead projectile into the shotshell. The heavy projectile has tremendous knockdown and penetration power. Initially, the slugs were simple round lead balls. Today's slug ammunition has come a long way! 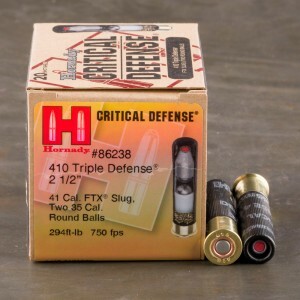 Now shooters can choose jacketed and polymer tipped "slug" ammunition for their "scatter guns." 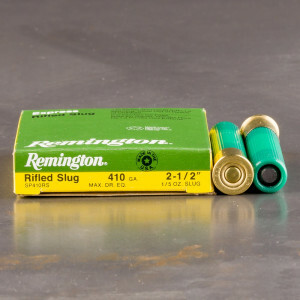 Some of the slugs are even for use in rifled barrels and are able to achieve rifle-like accuracy out to 200 yards! 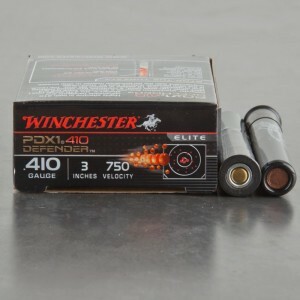 The 410 shooter has a number of factory-loaded ammunition offerings from which to choose even including hollow point rifled slugs for sale. Bullet Weight Not Applicable 1/5 oz. 1/4 oz. Shoots great in the Raging Judge. Will buy more! Showed up early. And did exactly what I ordered them for. If I could get around shipping cost, they would have been a good value also. Basically any 410 will handle this self defense load just fine. 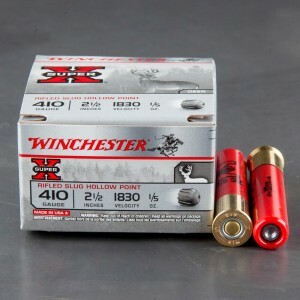 Just remember your 410 will not only handle the shot load, it will also handle a 45cal JHP shell. 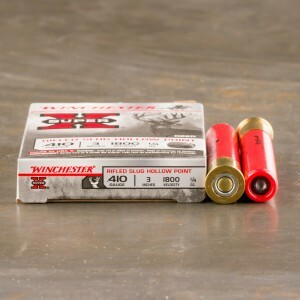 Here's the link info 20rds - .410 / .45 Defender Winchester Supreme Elite 2 1/2" PDX1 Combo Self Defense The dual purpose flexibility of the 410 shotgun or the Judge pistol helps you be more effective and flexible.